This year is coming to an end. All the wine rests already in the barrels, and the grapes for the Recioto are withering in the "fruttaio". 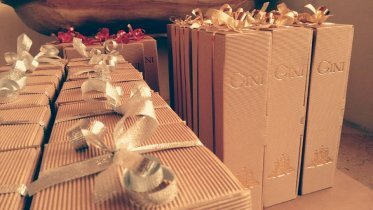 If you come and visit us in our cellars in Monteforte d'Alpone, you can taste our wines and create your own customized gift packs for a suitable gift to celebrate at every opportunity. We are open on Christmas Eve morning, Saturday, 24 December (from 9.00 to 12.30). Instead we will be closed Monday, December 26. From Tuesday 27 to Friday, December 30th we will be open with normal business hours (9:00 to 12:30 / 14:00 to 18:00). The winery is closed, however, from 31 December to 8 January. We will resume with the usual schedule from Monday, January 9, 2017 (our opening hours are Monday to Friday 9:00 to 12:30 / 14:00 to 18.00 and Saturday 9:00 to 12:30). Our heartfelt wishes for a Merry Christmas and a Happy New Year.